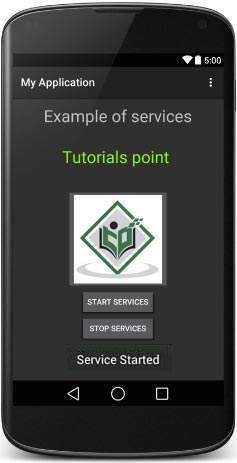 onStartCommand() The system calls this method when another component, such as an activity, requests that the service be started, by calling startService(). If you implement this method, it is your responsibility to stop the service when its work is done, by calling stopSelf() or stopService() methods. 1 You will use Android StudioIDE to create an Android application and name it as My Application under a package com.example.My Application as explained in the Hello World Example chapter. 2 Modify main activity file MainActivity.java to add startService() and stopService() methods. 3 Create a new java file MyService.java under the package com.example.My Application. This file will have implementation of Android service related methods. 4 Define your service in AndroidManifest.xml file using <service.../> tag. 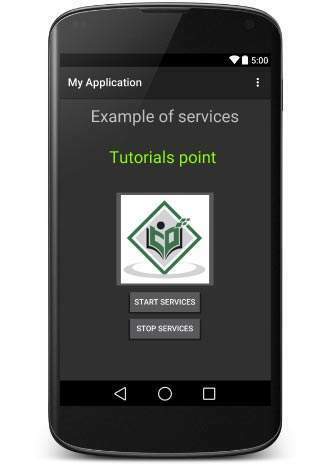 An application can have one or more services without any restrictions. 5 Modify the default content of res/layout/activity_main.xml file to include two buttons in linear layout. Following is the content of the modified main activity file src/com.example.My Application/MainActivity.java. This file can include each of the fundamental life cycle methods. 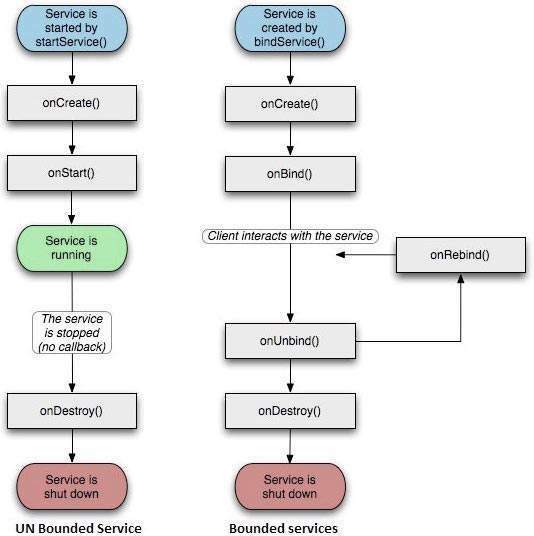 We have added startService() and stopService() methods to start and stop the service. To stop the service, you can click the Stop Service button.